The gothic cathedral that stands in the French town of Chartres is the sixth church or cathedral constructed on that site over 1,500 years. Although the present cathedral is recognized as a place for Christian pilgrimages, it is considered mysterious. vision, an image of the virgin with the babe resting on her knee was carved from a peach tree and placed next to the well and the power point within the dolmen. When the first Christians appropriated the area in the third century, they built the first church dedicated to Our Lady on the site of the dolmen, mound, and well and placed the image of the Black Virgin in the church's crypt. The Duke of Aquitania burned the first church in 743; Vikings destroyed the second in 858. The third and fourth churches were burned in 962 and 1020, and the first of the cathedrals was destroyed by fire in 1194. Each time the place of worship was burned or crumbled, faithful Christian townspeople, builders, and architects appeared to rebuild the structure. 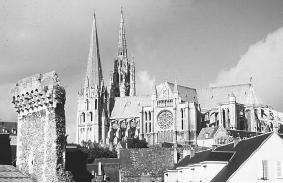 But the identity of the master builders who constructed the majestic Chartres Cathedral that stands there today remains unknown. Images of Chartres Cathedral. [Online] http://www.bluffton.edu/~sullivanm/chartreswest/centralportal.html. Westwood, Jennifer, ed. Mysterious Places. New York: Galahad Books, 1987.